Successfully Added Dual Propeller RC Micro Helicopter to your Shopping Cart. Dual propeller RC micro helicopter. Take to the skies with this ultra-realistic RC copter. This helicopter may be small, but its full-body design, authentic-looking cockpit, flashing lights and twin propellers will have your friends staring in awe as you buzz past their heads. The micro 'copter's even weight distribution and twin propellers help it fly a steady path as well as hover in place. With easy to use controls, a sturdy body, and a realistic design, this micro helicopter is safe, fun, and easy! With three channels of control, you can fly one helicopter while your wingmate flies another. The controller lets you change altitude, move forward, backward, left, right and hover in place. 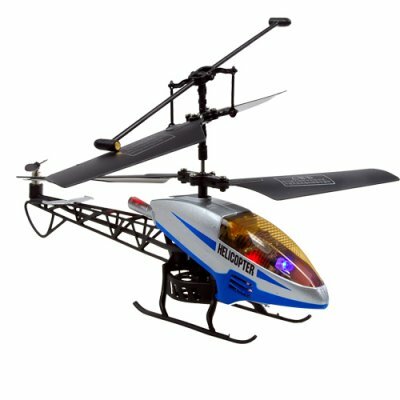 Don't wait to get your hands on this Micro Helicopter, it is available now at a low, factory direct price from the leader in the coolest electronic gadgets - Chinavasion. Micro sized radio controlled helicopter with full flight function remote. 3 channel RC micro helicopter. Nothing extra is needed. Just put in your batteries and fly! on 2009-08-04 07:46:12 Very cool helicopter! The helicpter arravied very fast to the Faroe Island, it taks a while to learn how to control it, BUT, it have very cool light and its very small, it works best to fly inside, than thank you chinavasion!